There has never been a book that collected cocktail recipes that tie the 1920s together with the celebrities of the era that made the drinks so famous. This is that guidebook. 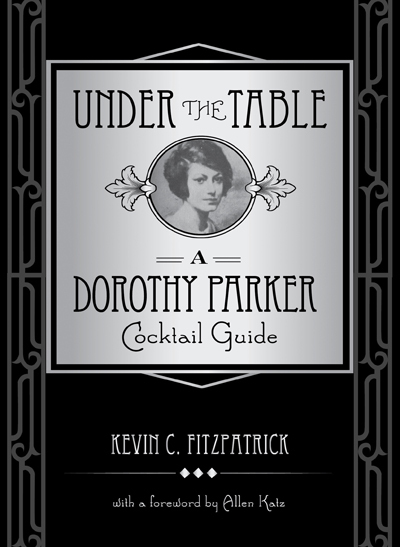 Under the Table: A Dorothy Parker Cocktail Guide was written by Kevin C. Fitzpatrick, author of A Journey into Dorothy Parker’s New York and president of the Dorothy Parker Society. The handsome book has delicious recipes from A-Z: The Aviation to The Ziegfeld. 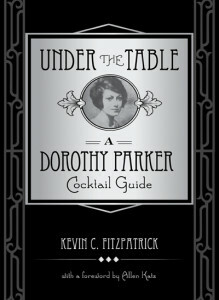 A bar book for Jazz Age enthusiasts and literary tipplers alike, Under the Table offers a unique take on Mrs. Parker, the Algonquin Round Table, and the Jazz Age by profiling and celebrating the drinks that she, her bitter friends, and sweetest enemies enjoyed and discussed. Each entry of this delicious compendium offers a fascinating and lively background of a period cocktail, its ingredients, and the characters associated with it. The book is filled with vintage photos and illustrations, designed like a time capsule from the 1920s. The book also features a special selection of twenty-first century speakeasy-style recipes from top mixologists from across the country. A complete recipe with detailed instructions forms the centerpiece of each entry, and topping it off are illuminating excerpts from Parker’s poems, stories, and other writings that will allow you to enjoy her world from the speakeasies of New York City to the watering holes of Hollywood. The foreword is by Allen Katz, cofounder and vice president of the New York Distilling Company, which makes Dorothy Parker American Gin. The director of spirits education and mixology for Southern Wine & Spirits of New York, he is a past chairman of Slow Food USA. Allen serves on the board of directors for the New Orleans Culinary & Culture Preservation Society and the Manhattan Cocktail Classic.